Planning to lose weight over the coming months? Attempting to change your eating habits to a healthier lifestyle? Training for a sports event? If the answer to any of these questions is yes, then you will find this weekly meal planner Excel template very useful. Instead of writing down your meals on paper, or trying to recall them from memory, you can use this excel template to track what you have been eating. 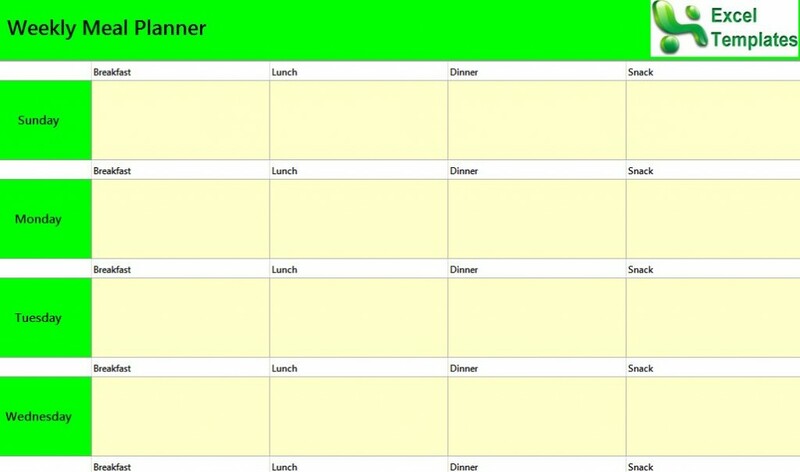 The weekly meal planner template is designed so that you can enter information regarding what you eat. There is a space for information about breakfast, lunch, dinner and snacks. You can see what you ate from Sunday until Saturday on one page, without having to think twice about it. It has been said that the best way to lose weight is to track what you eat. It is not about counting calories, but simply writing down what you eat for future reference. This way, you will know which days you stuck to your diet plan and which days you diverted from it. If you are training for a sports event, it is crucial to eat right and to eat multiple meals throughout the day. Not only will the planner help track what you eat, but it will serve as a reminder to eat healthy throughout the day. 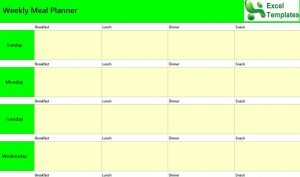 With the meal planner template, you will have a record of what you ate for months at a time. Simply enter a week’s information and save the tab on your computer. There is no limit to how many tabs you have on the template. Another positive element to the weekly meal planner template is the ability to share your weekly meal details. If you have a nutritionist, you can simply email them the data or print it out before meeting with them. This is the most efficient manner to record weekly meals. After you use the weekly meal planner for a month, you will be amazed at what a difference it makes. Not only will you have complete knowledge of what you ate every day, but the planner will help you maintain your diet plans.